How we successfully branded a merger; developing an integrated identity. 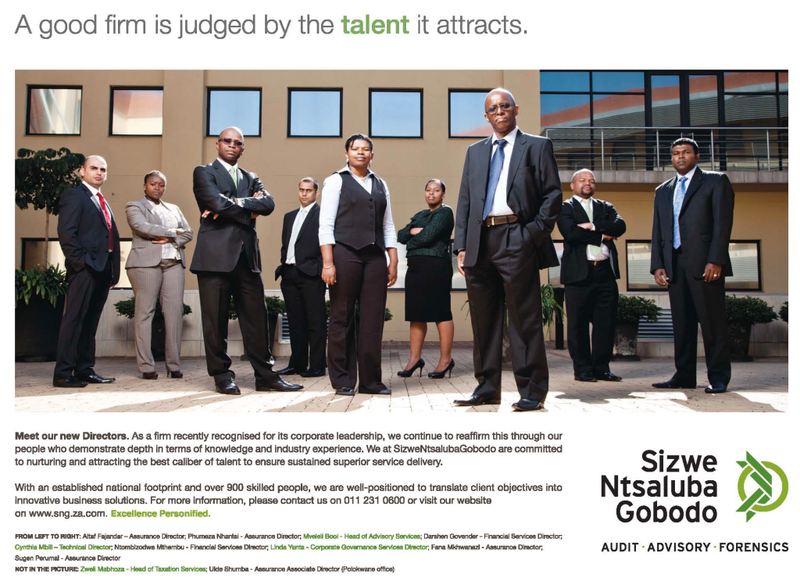 Two of South Africa’s top black accounting firms SizweNtsalubaVSP and Gobodo Incorporated merged to be SizweNtsalubaGobodo. This move immediately thrust them into being the fifth largest accounting and auditing firm in South Africa thus redefining the landscape of the South African auditing and accounting profession. SizweNtsalubaGobodo became the largest black-owned, controlled and operated firm in the country while offering a new model for economic transformation which is more than just the transfer of ownership. Our task was to develop and launch a new brand identity for the merged company, as well as implement a brand roll-out campaign that would start with the announcement of the merger to the media then proceed to create awareness amongst the various key audiences such as Government stakeholders, decision-makers in business, industry peers, the general public and internal audiences at the firm such as staff, directors and partners. We developed an integrated brand roll-out plan that was hinged on a ‘Brand positioning statement ‘or theme of – INDIGENOUS EXCELLENCE. The BPS was also used as the launch and positioning campaign‘s golden thread/hinge for all channels/ platforms carrying the new brand message. Media Conference – to announce the merger. Launch Event – to introduce and launch the new firm to key stakeholders. Advertising – to creative awareness of the brand and to claim the right position in the industry as ‘the fifth largest audit and accounting firm in South Africa’. PR and Media Liaison – to cement and emphasise key messaging in order to generate further awareness and talkability. Brand Roll-out plan – to roll out the new brand identity and have a strong presence internally and externally i.e. signage in all offices in the regions, stationery etc.